Deluxe Edition including all the DLC. Standard Edition also available. 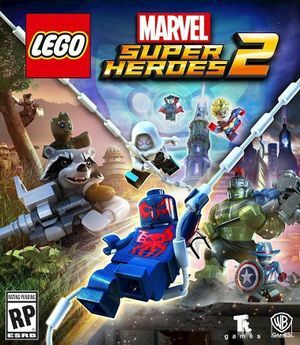 See Helix Mod: LEGO Marvel Super Heroes 2 (DX11). Presence of Oculus Runtime Drivers on they system may cause micro-stutter, manifesting once every few seconds, as the game's video freezes for a fraction of a second, then resumes. Audio is typically not affected. The timing of the stutter is very regular and seems to be related to network activity (Oculus drivers pinging home at regular intervals when present). To avoid this issue, disconnect from the Internet altogether. Blocking the game's executable using firewall does not solve it. Alternatively, uninstalling or manually stopping Oculus drivers also resolves the issue. ↑ 1.0 1.1 File/folder structure within this directory reflects the path(s) listed for Windows and/or Steam game data (use Wine regedit to access Windows registry paths). Games with Steam Cloud support may store data in ~/.steam/steam/userdata/<user-id>/647830/ in addition to or instead of this directory. The app ID (647830) may differ in some cases. Treat backslashes as forward slashes. See the glossary page for details. This page was last edited on 10 November 2018, at 03:18.